Avatar Languages is another language school that is also active, but the classes are one-to-one: http://www.avatarlanguages.com - check out their blog for ideas of how you can teach ESL without having land in SL. There are others, but most of them do not offer any innovative practice and show signs of trying to jump on the bandwagon without doing any legwork. The blog will specialise in collecting news, information and ideas for teachers who want to use computer games and other digital toys to help language learners in and out of class. This is something that we both have been involved in for several years now, especially in our jobs as teachers of young learners. During this time, we have tried out different ideas of exploiting digital games with young learners of English and teenagers, and have introduced a lot of our colleagues to using these too. The interest has grown and now many of our colleagues turn to lesson plans and worksheets featuring online games when they have a computer room slot. Of course, we have presented our ideas about using digital games at various conferences and have had articles and ideas published in various places too. The next, natural step seemed to be to set up a blog to help draw the ELT world's attention to what can be done. And so, Digital Play was born. Hope to see some of you over there sometime. The talk soon turned into a discussion with different participants agreeing / disagreeing with Nik. Talk mentioned the backchannel of the text chat sometimes interrupting the flow during meetings. One participant, however, stated evidence has found that some students are more forthcoming because of this. Another mentioned the levels of control that classroom teachers have that do not exist in Second Life. She mentioned that this is similar to teaching high level business students - often teachers have to accept the interruptions that a lot of these (especially one-to-one) classes involve. Interruptions such as mobile calls, etc. Teaching in SL involves a similar degree of relinquishing control. Participants mentioned that groupwork is possible but other activities such as mingling activities do not work. Using different parcels or sending students to different areas makes groupwork possible. Nik mentioned that in particular, organisations that set up their SL schools like their RL schools have more problems than other types of language teaching organisations in SL. Another participant said that many professionals involved in distance learning now agree that distance learning is often more labour intensive than RL teaching and that the ideal group size would be around ten people. Monitoring student groups in Second Life is difficult according to Nik. And the idea of working with smaller groups means it is more difficult to make teaching languages in SL economically viable. There are lots of opportunities online for autonomous language learning but they are few and far between in SL. Participants stated that SL should be used for what it is good for, and there's no point trying to use Second Life to do everything when there are bettwer ways of doing certain things elsewhere online. Second Life, according to one participant is an example of disruptive technology. Development in SL is definitely catching up though. SL is a graphics delivery system and its ability to deliver motivating text is still a challenge. If you compare notecards to typical worksheets and handouts there are limitations (no formatting, they do not behave consistently, they don't look very good). Placing text in SL on the wall etc. is still not satisfactory. Nik thinks that SL regulars get strangely attached to their avatars. This attachment is something that puts SL on a different level from 2D Web. He also mentioned that if he has met someone in SL, he feels he has met them "on a deeper level" than those he has only talked to on Skype or exchanged emails with. It is easy to develop an identification of ownership of space. You can't build same kind of attachment / sense of ownership to a Moodle space, for example. Nik suggests providing space for students - it will motivate them more if they can take ownership of the space and will provide a stronger pull to keep them interested as 'virtual residents' . Sites such as livemocha, italki, and other language exchange sites work well and he believes that this could be done much better than it is in Second Life, with people helping each other to learn a language. One participant mentioned this is an extension of tandem learning and pairing students up can work very well and offers great potential . One of the problems for students find is not being able to find someone. Enabling students to find others to help them, to get feedback, etc offers great potential. Nik thinks that SL offers a more authentic experience than learning in a classroom environment, which is very synthetic. SL hasa much more genuine correlation to the way languages are generally learned. For example, there are real businesses in SL - there are real activities going on. If language teaching can tap into this, the real things that are happening, then this can provide a very authentic experience for students. There is a great opportunity to do this in SL and work on projects such as machinima / theatre in order to motivate students to use language in a real way. Nik thinks SL is a playground and believes that SL can offer a great place where games can be created and played, motivating students through SL's visual strengths. Many classroom activities do not work very well in SL. They lead to groups of students standing around in circles reading notecards. He believes the environment is so visually strong that we need to be able to use it, to create large spaces with motivating games. This will take serious groups of people with serious SL skills to be able to do this. One participant mentions the common misconception of people thinking of SL as a game. This is good because it is attractive to students who like games. But it's also bad because teachers generally think of SL as a game and don't take it seriously. Discussion moved onto Marc Prensky and the use of games in teaching and to another virtual world, There. Nik mentioned that he was impressed by this virtual world. Strong motivations in computer games (mastering tasks, preserving life, evading enemies, etc) are lacking in SL. People will do things over and over again in order to get to the next stage of a game. This is one of the strengths of gaming that could be built into learning. We are never really sure that SL is going to work when we go there. This makes it difficult if you are offering a commercial product and students cannot get into SL for example. Being interrupted by people during a class can be a problem. One way round this, according to a participant is to locate the classroom on a sky platform. The key is to teach people how to deal with this when it happens. A griefing incident can be turned into a strength if the griefer can be engaged in conversation by students, etc. Nik mentioned that using a female avatar brought him more attention on There - he got approached a lot more. One participant expressed that she loved the feeling of playfulness that SL gives her. She mentioned getting involved in activities that she wouldn't do in RL. The discussion came to an end with Nik mentioning the resistance that someone had in their organisation to using Second Life. He believes that there are so many changes that have happened to teaching and education through technology in the last 5 years. The average teacher now has a huge amount of pressure to learn new skills and to step in front of their students and to use these skills. It is a great challenge for teachers and lots will need to take it slowly. Nik believes the best way to introduce SL to other teachers is to make it part of their professional practice first, before it can ever be part of their classroom practice. Teachers then will feel more comfortable about using it with students. Nik then mentioned that the whole nature of the way we communicate is changing because of technology, and what we teach and the way that we teach it should reflect this. If our students want to use these tools, then they'll need help. Just as students needed help with writing a letter, then some will need help communicating in places such as Second Life. One participant mentioned that SL would benefit a good intermediate learner best. Nik said that for students who have a gaming background find SL much easier to use and understand. All-in-all a very stimulating discussion. There is currently a debate going on in the IATEFL Young Learner SIG Yahoo Group about the the pros and cons of publishing digital ELT materials/resources as compared to paper-based ones (i.e. books). I have been reading the posts on this thread with a great deal of interest, and can't help thinking that those defending the paper model echo what many in the music industry were saying about digital downloading when the first effective model (Napster) came on the scene. There was a time some years ago when the music industry had a real chance to utilise the emerging technology to provide a new business model for the industry. Instead, they chose to ignore the change implied by the new technology. As we all know now, this has led to widespread adoption of illegal file-sharing and huge losses by record companies all over the globe. Despite efforts to stop this (DRM, court cases, legal file-sharing through iTunes, etc), most people feel the battle has been lost and musicians are starting to realise that the money has to come from elsewhere. Encyclopedias, dictionaries, and other reference wortks have been the first books to suffer (like it or not, Wikipedia is fast overtaking the Encyclopedia Britanica as a source of information - the pros of Wikipedia far outstrip the cons: in the 21st Century, our sources of information need to be up-to-the-minute and dynamic). What about the other arguments for paper-based material? Reading on a screen is not sustainable? You can't take it with you on the train? Devices such as Amazon's Kindle and Apple's iPod Touch and the iPhone have changed that. I no longer buy a daily newspaper - I download the news from the BBC and El Pais to my iPod in the morning and read that on the metro. What about the parts of the world where the Internet does not reach? The signs are that this will change in many of these areas. The Internet probably won't come via PCs, but will instead be available via mobile phones (did you know that most mobiles are in the developing world? ), which are becoming ubiquitous in most parts of the world. As we have seen (most recently in a heated exchange on Twitter between a wide variety of ELT professionals), there is a demand for digital copies of resource books and textbooks. The ELT publishers have yet to cater to this demand. The danger is that unless something is done, then what awaits them is what happened to the music industry re. digital downloading. In fact, it's already happening. There has recently been a proliferation of websites and blogs offering illegal copies of most ELT textbooks and resource books. These are generally scanned copies of the books advertised by the sites as 'free ESL books to download.' The website authors claim they are providing a service to people, "freeing information", etc. but look carefully and you'll see the sites are generally full of advertising, so their aim is to make money by illegally copying and distributing the books. I am not providing any examples of sites as I really don't want to encourage this sort of activity. Of course, the publishers act against these websites when they are found (it is common for authors to report them to the publisher), but I fear they are fighting a losing battle if legal downloading of digital copies of ELT books is not going to be offered. How things will turn out is difficult to say, but you can look at trends and predict. We are currently experiencing the death of the newspaper (http://www.newspaperdeathwatch.com/ - talk to any newspaper journalist and you'll hear the same thing). As mentioned before, the emergence of new reader-friendly devices and increase in Internet mean that the demand for digital downloads will increase whether you like it or not. Although I am a book-lover and know I will continue to buy and read books for the rest of my life (I am also writing one! ), I do think that the shift from paper to digital materials in ELT is inevitable. Recently, I've been thinking about blogging and why people do it. I've been encouraged by the nomination for an award I mentioned in my last post, and by Karenne Sylvester's call for entries to the blog carnival she has organised to help newbie EFL bloggers. So, what makes someone sit down and write something and publish it on the Internet for all to see? In particular what makes an EFL teacher do this. The main reasons I suppose are self-expression, to communicate with other teachers, to share ideas, reflect on practice. Of course there's also the teacher who wants to try it out because you want your learners to blog and you don't think you should ask them to do something that you wouldn't do or haven't tried . That's why I started. Let me start with some statistics - I've been blogging at http://blog-efl.blogspot.com for six years (since July 9th 2003), have written 553 posts so far and over 60,000 words. My first post was directed at a group of teenage learners I was teaching in a summer school in Barcelona. I wanted to try out a new global community my school had set up for learners and had managed to get a daily computer room slot. Then, at the last minute, I was told that my students wouldn't be getting accounts in time, so I needed a backup plan. I remembered that a friend of mine had invited me to set up something called a blog six months previously - I'd joined and written one post and then not returned. But, I had seen that it was a quick and easy way of publishing on the Web and wondered if I could do this with my learners. I jumped in and all of the learners in the two classes I was teaching se up blogs and started writing about themselves and reading what the learners in the other class had written - their curiosity was provoked, and although few of them wrote much, they were motivated enough to want to write and to read what the others had written, sharing their interests, and asking questions by leaving comments on the other learners' blogs. I also started using the blog I'd set up to reflect upon the experience rather than write to the learners, as illustrated by the second post I wrote. By the end of the course, I was convinced that this was something that I should look into more, even though the learners had become a little bored with blogging during the course and I decided to do something else (you can read about this here if you like). I spent time after the course finding more out about blogging. 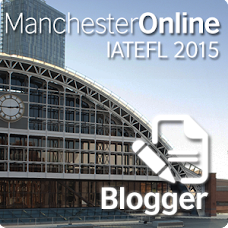 At the time, there was little written about blogging and only a handful of EFL teachers were using blogs. One of them was Teresa Almeida D'Eca's Let's Blog. Teresa is a teacher based in Portugal - I'd been introduced to her through my colleague, Nik Peachey (who funnily enough has only recently started blogging himself) and was very impressed with her blog. So much so, I wrote a review of it on my blog. I started learning a lot from the other educational bloggers out there about how best to use them. Aaron Campbell's article on Weblogging in ESL was very influential and there were tips from other bloggers about how best to encourage participation, and whether or not to correct. You can tell from the amount I was writing to the blog (48 posts in August 2003!) just how enthusiastic I was getting. In fact this figure only shows a small part of it - I'd also been put in contact with a teacher in Brazil - Barbara Dieu (or Bee), who had been blogging with her students for some time. I wrote a review of her blog, Bee Online and also started responding to some of her ideas she had. One of the many ideas that Bee had for promoting and sustaining learner interest in blogging was the idea of having a mystery guest on her blog. I was one of the two mystery guests in August 2003, and the results were convincing - the students responded well and wrote loads during this period. Bee said that they were all motivated and asking questions, trying to work out who the mystery guests were between classes, trying to get her to give them clues, etc. And afterwards, the conversations continued as we got to know each other. For me, this was the moment when I realised the power and potetnial of blogging with students. You can read the actual posts here - as a sidenote, I think it's wonderful that all of this still exists - it's been great to revisit this now, so many years afterwards. I went on to run my own blogging experiments with classes that year and several years afterwards. Some of them were successful, others not so much. I kept in touch with both Teresa and Bee. They introduced me to the wonderful Community of Practice, the Webheads in Action, and to lots of other educators around the world. I co-moderated a series of online workshops about blogging with Bee and Aaron Campbell through the TESOL Electronic Village Online. Eventually, though, I found my interests turning more towards podcasting and then to social networking and games and virtual worlds. However, I still believe blogging is a great tool to use with students, and although my own blogging output has diminished recently, I can see how valuable it is for teachers' reflective practice and for sharing ideas and building community. Especially now, that it has started to be used by mainstream EFL teachers rather than just those who are interested in technology. This for me, is the key, and the main reason why I am interested in blogging regularly again. So, what about the so-called blogger's block? Looking back at my blog entries, I can see that I have a lot of unpublished drafts. Posts that I started and didn't finish. And then I remember times when I wanted to write something and didn't. I think the most important thing is to be involved in the blogosphere. If you read other blogs (and nowadays take part in the conversations that are constantly happening in Twitter and Facebook, as well as on mailing lists, etc. ), then you'll never be short of ideas for blog posts. Of course, the other thing to remember is that blogging is all about contributing - and no matter what you think, everyone has a unique voice and a relevant point-of-view - you can always add something interesting to the conversation. Just, as Karenne recently encouraged me to to on Facebook, jump in and do it - don't think too much about it. Most of all, treat blogging as something you do for fun that can also help your professional development and you should be able to continue, happy in the knowledge that what you are doing is of value. Are awards important for bloggers? The reason I ask is because I recently found out I've been nominated for one (from Anna, whose excellent blog about her experiences in Second Life has also been nominated). The Top 100 Language Blogs 2009 Awards have been organised by LexioPhiles and there are four categories: Language Learning, Language Teaching, Language Technology and Language Professionals. I was surprised to hear that I'd been nominated, because I haven't been blogging here much recently (much of what I used to use my blog for has been taken over by Twitter or Facebook or Delicous). Surprised and also chuffed. And then I wondered why. Thinking about it, I realised I'd been wanting to get back into blogging, but needed a good reason for doing so. Browsing the other nominated blogs (for me - this is the most important reason for such awards - you can find out about bloggers you weren't previously aware of, or people you haven't looked at in a while), I started to realise just how much wonderful stuff was being written by so many. I know now should start making blogging a priority again, and wonder why I'd stopped doing so for so long. Hello again, Blogosphere! I'm back! And Thank you, Lexiophiles for giving me a reason to start blogging again. This year's SLanguages conference promises to be the best ever - it starts later today at 20.00 Central European time and continues for the next 24 hours. I'm excited to be speaking several times, first as part of the AVALON project, a European Union funded initiative, with 26 partners in 8 European countries. AVALON stands for Access to Virtual Learning live ONline, and our goal is to explore the potential for scenario-based language learning. This (tonight and then again tomorrow morning - see schedule for details) will be the first time we've spoken about it in public together - looking forward to it. I'm also speaking as part of the panel discussion plenary on language teacher training in Second Life, with Nergiz Kern, Nick Noakes and Dennis Newson, although I think Dennis can't make it after all. We'll be talking about our experience organising the TESOL Electronic Village Online session on Virtual Worlds & Language Learning. The social network, http://evovwll.ning.com, that was set up for the EVO session has now just under 3000 members, and the discussions and meetings have been continuing, even though the actual EVO session finished back in February. Finally, on Saturday I'll be talking about the Virtual Tourism CLIL course I organised earlier this year in Second Life. I'll mention how it went, include references to what the students thought about it (collected here), and finish off by taking people on a short tour of some of the places the students had to visit. If you're interested in innovative ways of language learning and teaching , be sure to check out the SLanguages conference - hope to see you there! I count myself among the lucky few who are going to attend in-person both of the upcoming events hosted by http://www.iatefl.org/ and the http://www.britishcouncil.org. 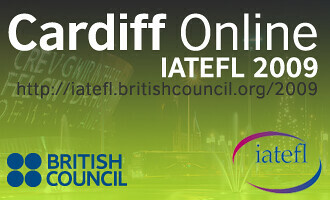 Starting on 31st March and running until 4th April, the 43rd annual IATEFL conference promises to be the best yet. The range and quality of the speakers at the IATEFL conference always poses a challenge when you're flipping through the programme deciding who to go to hear speak, although little does it matter, as rarely, in my experience are you disappointed. Last year, there were 1600 participants at the conference and 5000 participating online. This year promises to be even better, with far more activity going on online to bring those not at the conference closer to the action. Apart from the live broadcasts of the plenaries and video and audio recordings of some of the other sessions, wifi access at the conference means some participants in sessions will be live blogging or twittering (using http://www.twitter.com) to keep people in the loop. Should be a very special event indeed. This event promises to be a real treat for anyone who teaches young learners, and there are three strands to the conference, which are CLIL (Content & Language Integrated Learning), Learning Technologies and Testing & Assessment. Although there won't be as much online activity at this event, there will be some, and I have agreed to try my best to keep people informed by blogging here. I'll also be twittering at http://www.twitter.com/grahamstanley - hope that some of you at least can join us for the educational journey!